GDPR, that is Regulation of the European Parliament and of the Council (EU) 2016/679 of 27 April 2016, Official Journal of EU L.2016.119.1 of 4 May 2016, shall apply from 25 May 2018 (hereinafter referred to as the Regulation). The processing of your personal data takes place for commercial and marketing purposes, as well as for answering questions sent via web forms. Based on your data, you may be subjected to a profiling mechanism using your location and information about the products you were interested in. Profiling can be used to customize some of the information displayed on the website. You are entitled to request from us the access to your personal data as well as to correct them, if they are inconsistent with the actual state and, in the cases provided for by law, to remove them or to restrict their processing. You have the right to lodge an objection to the processing of your data. We will examine such an objection. You will have the right to transfer the data or to obtain copies of the data, but this right cannot adversely affect the rights and freedoms of other persons, including trade secrets or intellectual property, and it will be exercised in the technically possible scope. You have the right to contact the person dealing with the matters related to personal data protection. 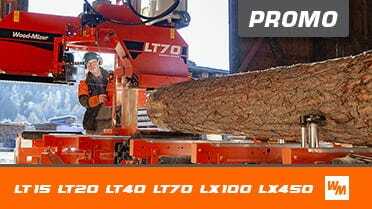 You can send correspondence to our address or directly to the competent person iod@woodmizer.pl. Session cookies are files temporarily stored in the browser's memory, which are kept until the session is over. Persistent cookies are files that remain in the browser's memory as long as allowed by the browser settings selected by the user. Own cookies coming directly from a visited web page. External cookies coming from an external website, other than the website visited. Configuration cookies allow setting functions and services in the website. Essential cookies allow using the services available in the website. Functional cookies allow storing the website functionalities preferred by the user. Advertising cookies allow providing advertising content adjusted to user's interests.